I have been layering found images into my paintings for the last several years, but sometimes I wanted the paint to have more surface texture. 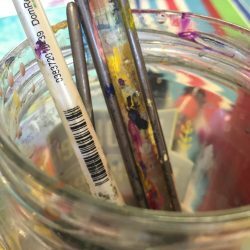 There are many additives you can put into acrylic paint, but most of them either take a lot of layers to build up a thick surface, or they are opaque. I wanted the texture, but still with transparency. Enter encaustics! 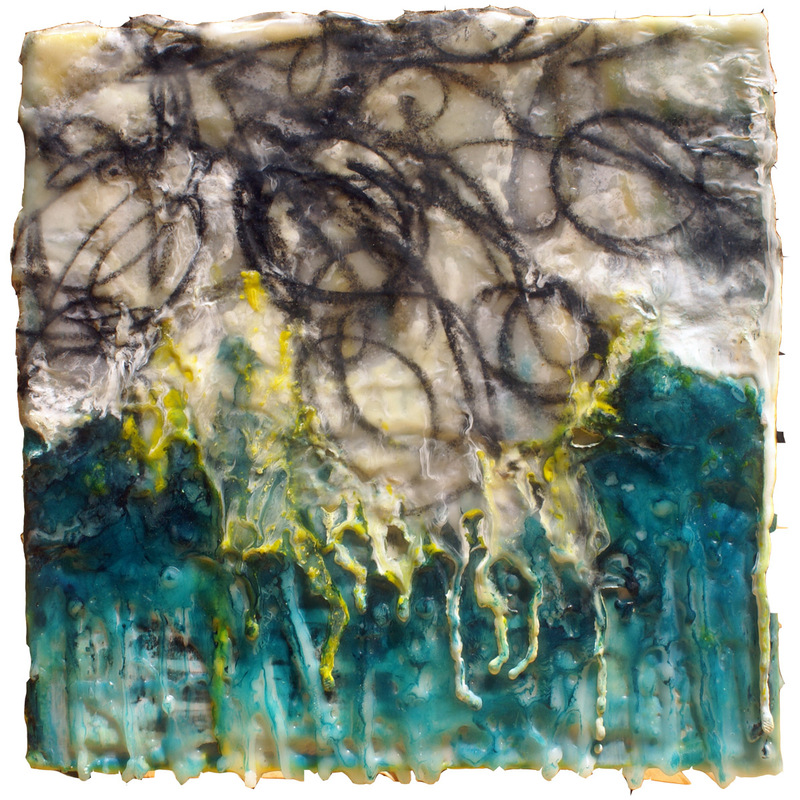 I have admired encaustic work for some time – it has a very deep, luminous quality — but wasn’t quite sure how the process worked. So, I took a couple of classes over at The Encaustic Center in Richardson and immediately knew this was a medium that I could continue to experiment with. 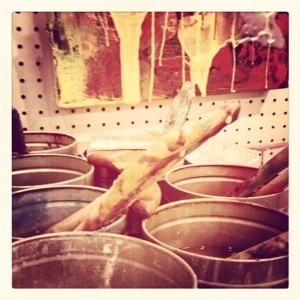 What is encaustic? It is painting with heated beeswax! It’s an old method that has been around at least 2500 years, and was used by the Greeks and Egyptians for painting everything from boats to portraits. 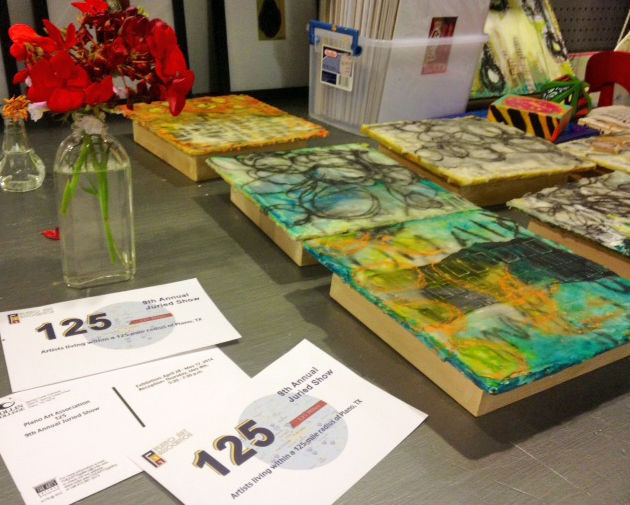 Find out more about the history of encaustic painting HERE. Probably one of the most notable artists from the past 50 years that employed encaustic painting in his work is Jasper Johns, famous for his paintings of maps and the American flag. I make my encaustic medium (beeswax + damar resin) in a large electric skillet. I then use oil paints to add the color (pigment) to the clear medium. I have a separate griddle for this, with 16 oz. ink tins lined up with the colors I want to use. This is the same setup used at the Encaustic Center, and in most books and articles I’ve read on encaustic painting. Some artists buy their encaustic paint already made (R & F has some really good paints), but they are very expensive. What I love about encaustic is it’s a very fast, spontaneous medium. It dries quickly (think of how fast candle wax hardens), and can be used for both additive and subtractive techniques. You can also layer paper into your work easily — including drawings, photographs, collage, ephemera, etc. Imagine how exciting this was for me, as I love to glue all kinds of things into my paintings! 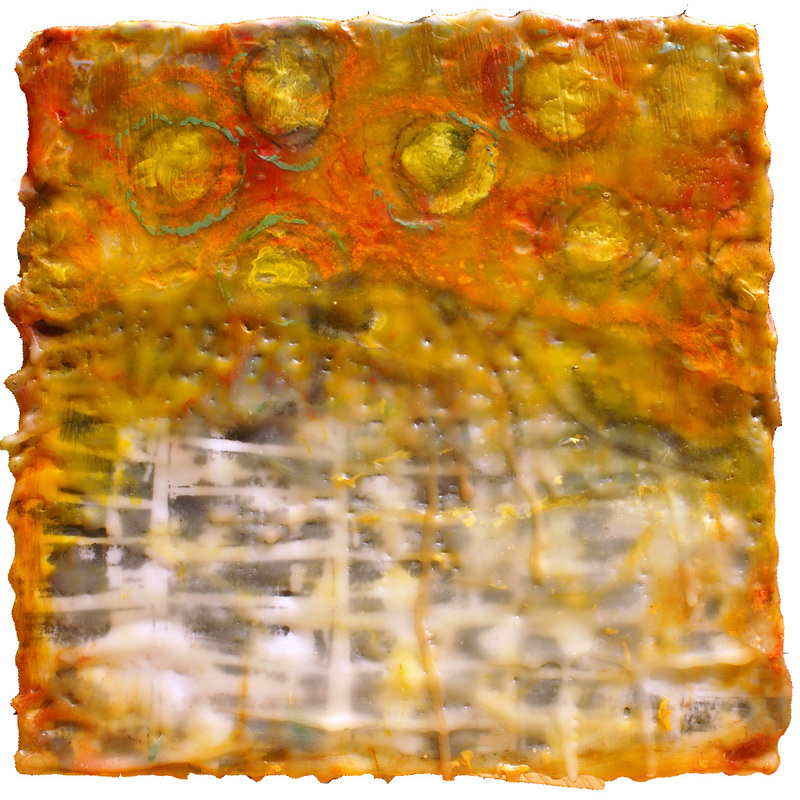 To have a true “encaustic” painting, you have to fuse each layer together, slightly re-melting each layer to make sure it adheres to the one below it. I use a heat gun most of the time, but have just started enjoying using a torch as well. (However, when I add paper, I try to keep the torch far away). In my newest series, I drew with charcoal or pastel onto tissue paper, then layered those drawings into my paintings using clear encaustic medium (clear paint, with no pigment added). The tissue paper became so transparent, that you can hardly detect the edges in the painting. It allowed me to “float” my drawings on top of previous layers of collage and paint. And the drips are now in 3D! 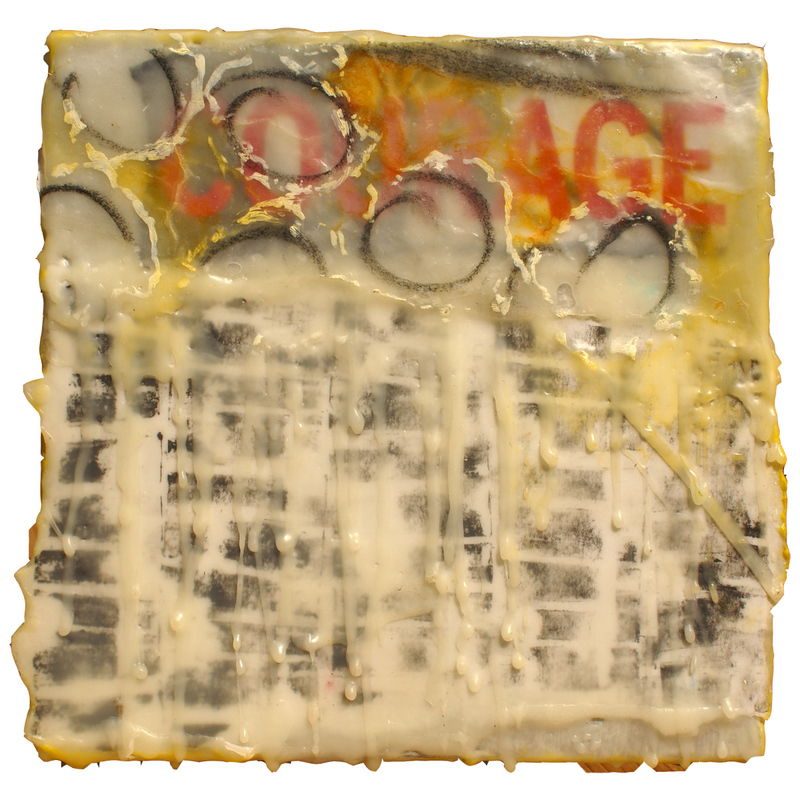 I just added a few more encaustic pieces to my web site, which you can find HERE. And I’m happy to announce that two of my larger encaustic paintings were accepted into the 125 Juried Art Show, which opened yesterday. The show is at The ARTS Gallery at Collin College, 2800 E. Spring Creek Parkway, Plano, TX 75074. The show runs April 28 – May 17, with a reception on Thursday, May 8 from 5:30 – 7:30pm.